Create quotes quickly and easily streamline your sales cycle and increase deal velocity. Sugar’s Quote Management System combines both an intuitive user experience with an extensible platform serving the needs of businesses of all sizes. Categorize quoted line items with grouping capabilities for superior organization and readability along with the ability to add inline comments for better detail. Build quotes with greater efficiency via drag and drop reordering and export functionality to send to customers in their preferred PDF custom template. Sell globally with multi-currency support. Work within your preferred currency while accommodating your customer’s choice within the same quote proposal. 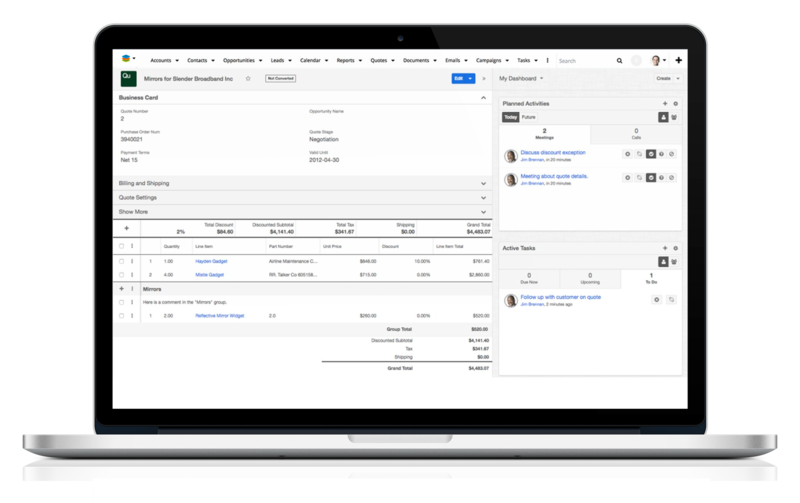 Pair Sugar’s Quote Management System with Sugar Advanced Workflow (available with Sugar Enterprise and Sugar Ultimate) to design and execute your business specific routing and approval rules. The module also leverages Sugar Logic technology for it’s calculated fields meaning that customizations for field calculations and formulas come right out of the box. Businesses with complex quoting requirements also have the opportunity to extend the Quotes module in a more upgrade safe manner.